På denne siden finner du en oversikt over masteroppgaver som er basert på materiale fra MAREANO. Norwegian territorial waters are some of the most intensively exploited and well-studied marine ecosystems in the world, but few holistic studies have taken into account non-target species, the community ecology and the deep part of this area is poorly known. This study uses video observations of demersal fish fauna to describe fish assemblages, to identify their association with important habitat features and relate these to anthropogenic threats. 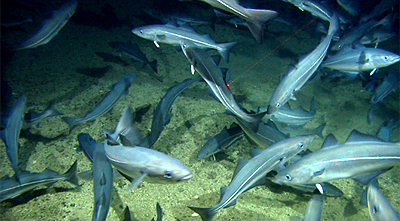 Compared to pelagic fish, demersal fish occupy a more restricted spatial range and could therefore be more easily related to a specific environment. Environmental factors tested include a wide range of variables, e.g. temperature, salinity, substrate type, food supply and currents. The primary goal was to determine whether the dispersion of demersal fish at a fine scale can be explained by only depth and temperature (water mass) or if bottom types and/or seascapes were also necessary to take into account. Then the identified assemblages were tested for sensitivity to human perturbations such as fishing using Vessels Monitoring Survey data. Three main fish assemblages have been identified: a shallow, an intermediate and a deep one. The water masses, with the depth and the temperature as proxies, appear to play significant roles in the fish distribution on a large scale (regional area, bigger than 10 000 km²). Nonetheless, seascapes associations and even bottom types appear to have an important role at smaller scales. Fisheries seem to have a strong impact on the dispersion of the shallow main fish assemblage. Basert på analyserte video-opptak fra Tromsøflaket. Data innsamlet av MAREANO i 2006. MSc Universitetet i Bergen, Marin biologi. Effekter av bunntråling på habitater og bunndyrsamfunn ved Tromsøflaket ble undersøkt ved å sammenligne abundans og faunasammensetning langs en gradient av trålpåvirkning, i tillegg til å undersøke sammenhenger mellom naturlige miljøfaktorer og bunndyrsammensetning. Generelt indikerer resultatene at bunntråling har negativ effekt på biodiversitet, og at diversiteten sank langs en økende gradient av trålpåvirkning. Selv om det var små forskjeller i taksonrikhet på tvers av ulike kategorier av trålpåvirkning, viste similaritetsanalyser at det var størst forskjell i faunasammensetning mellom områdene som var henholdsvis minst og mest trålpåvirket. Analyser av radionuklider i sedimentkjerner samlet inn i MAREANO-programmet. MSc Universitetet i Bergen, Kjemisk institutt. Konsentrasjonene av 137Cs i overflateprøvene varierte fra 3.9 til 31.7 Bq/kg tørrvekt. I tre kjerner økte konsentrasjonene noe nedover i kjernen (til maks 55.3 Bq/kg tørrvekt). Overflatekonsentrasjonene er på samme nivå, eller noe høyere, enn de vi finner i andre overvåkingsprogrammer. Det ble funnet en sammenheng mellom konsentrasjonene av 137Cs og kornstørrelse. Videre ble det funnet en sammenheng mellom konsentrasjonene av 137Cs og nivåene av polysykliske aromatiske hydrokarboner (PAH), representert ved PAH-16. Årsaken til dette kan være at både 137Cs og PAH-16 har en tendens til å binde seg til fin-kornete sedimenter som leirmineraler. Resultatene fra 210Pb-dateringen til DHI er stort sett innenfor den estimerte usikkerheten for de fleste prøvene datert i dette studiet. Dette indikerer at 210Pb-dateringsmetoden implementert ved Havforskningsinstituttet gir resultater av en tilfredsstillende kvalitet. Increased human use of the Barents-Sea Lofoten area necessitates ecosystem-based management action that coordinates economic interests while maintaining ecosystem health. Defining and mapping deep sea benthic habitats, which typically contain a high concentration of habitat forming species susceptible to anthropogenic pressures, is a crucial step in delineating areas for use and areas for conservation. However, this process proves difficult on both a scientific and management level due to lack of knowledge, and the ambiguity of current definitions in different management frameworks. This thesis used Marine Areal Database for Norwegian Waters (MAREANO) Programme data from Troms II, Nordland VII, and the Andfjorden Transect, one of Norway’s 36 proposed marine protected areas, to analyze the spatial distribution of sea pen, Umbellula, hard bottom coral garden, deep sea sponge aggregation, and glass sponge sensitive habitats. The varying environmental factors associated with areas of high species densities were studied to stress the importance of establishing a density threshold for when a habitat should be considered sensitive. Density thresholds established were 12.2 sea pens per 100 m², 3.7 hard bottom coral colonies per 100 m², 1.5 glass sponges per 100 m², 4.1 demosponges per 100 m², and 0.9 Umbellula per 100 m². The density threshold, and the associated depths, preferred sediment types, predominant species, and occupied extension/surface of areas with densities above this threshold were used to create each sensitive habitats definition. The resulting definitions and associated maps can change the way these habitats are managed by providing the basis for recommendations of areas for impact assessments, closures, or further analysis, as well as the monitoring of human impact and natural variability over time.